I've been awarded a blog award! I've been award the Liebster Blog Award! If you haven't heard about the Liebster Blog award, here is some info. It is a way to share information about smaller blogs ( less than 300 followers) as a way for us little guys to recognize other small blogs to get more followers, and some blog love. It is given to bring light to new blogs, and it's a great way to share blogs that might not otherwise be seen that often, or ones you want to share with others. Creating a post where you blog about the Liebster award & reveal your 3-5 blog picks. Let them know you chose them by leaving a comment on their blog. Copy & paste the blog award on your blog. Have faith that your followers will rally & show their crafty love back out to those you awarded! Stop by and check out their blogs! She loved it!! I even took a frame I currently had, and altered it a bit, so she would have a "complete package". I love it when my friends and family give me challenges to do - creatively! It makes me broaden the possibilities! "My Friend", and accented them with some Stickles in Paprika! 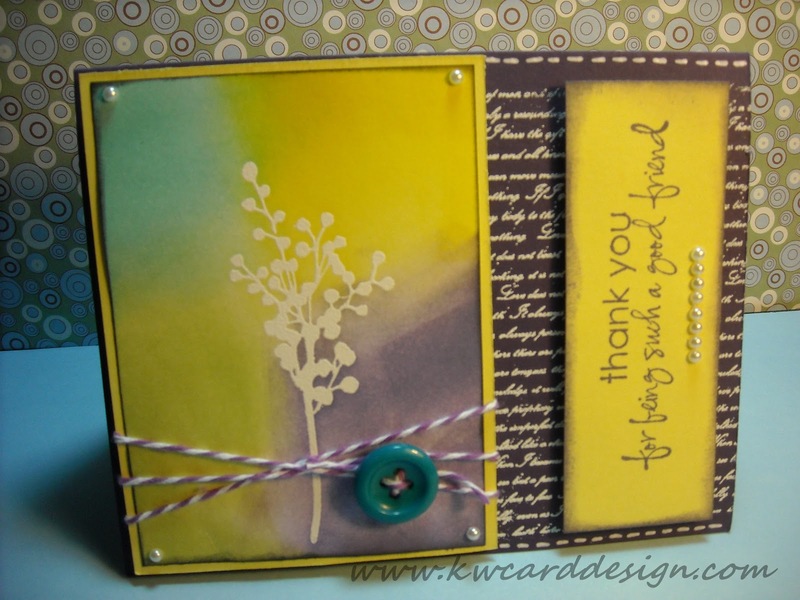 I just love Stickles, you can do so much with that stuff! Anyway, then I took a trip to Wal-Mart and purchased a frame that really accented the whole project! It think it turned out nice. In other news::: I mentioned in the last post that I had purchased some craft goodies- and among all the stuff I've have ordered from various places, one that I was really looking forward to was my Clip It Up! I bought it at Overstock.com for 43 bucks and some change, with FREE SHIPPING! I got a pretty good deal on it I think. I already love it. I have at my finger tips my clear and cling stamps, that are not already in clear DVD cases ( most if not all Stampin' Up). I still have like 3 or 4 orders that should be trickling in next week. I am really anxious for my PaperTrey order. This is my first order with them, and I know that they have quality products. Well, believe it or not, I think I have my craft room in the arrangement that will stick for a while! Never thought I would say those words. The only thing that I would like to change is the actual wall color from dark purple, to maybe a pretty green or blue, but I don't see that happening anytime soon. Maybe one day. OK my friends, I have rambled on long enough. I don't want to run you all off with boredom! :o) Love to all!! Happy Tues evening my friends. Hope all is well with everyone. Recently over the last few days, I have bought some craft goodies ( I haven't received any of them as of yet, but they are coming). I made my first purchase from PaperTrey, Inc. 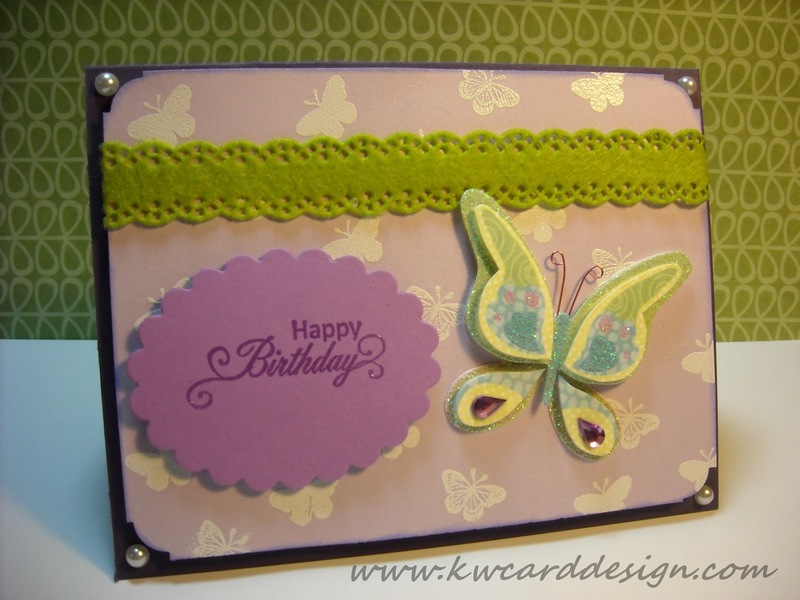 I have heard so many wonderful things about their products, especially their ribbon and card stock. So, I bought the card stock sampler that they have, and also various colors of their ribbon. I'm excited to receive their ribbon and try it out. Also- I broke down and went ahead and purchased a Clip it Up. If you have seen my videos on You Tube of my craft area- you will notice in the beginning of video one- I showed on my first wall the long Bygel rail from IKEA. I had made this into my "homemade" clip it up. It was just fine, other than the fact that it was so far away, and not right at my finger tips where I would like to see what I have in my clear/cling stamps. I think I will like this better!! Also- I have just made some other purchases from Eyelet Outlet, and Stampin Up with their clearance I bought more ribbon their too. Not to mention, made purchases through the SU parties I attend. Good thing we have a refund from the IRS!! (tee hee) Not to worry, I am not just blowing this money- I am actually doing good things with it too, like paying on or off a couple of our bills that need it the most. Well- onto my card share. I really, really, really love this card. I had made it especially for a good friend of mine that recently had surgery, and was recovering at home. She loves owls, and how could you not by looking at this adorable dimensional sticker! This card has a lot going for it- lots of color, and just pure happiness. It was a hit for sure! I really never know how some of my cards will turn out because I don't do like some, and do a sketch before hand. I just go with what I have, remembering what the person I am making for likes as far as color, animals, flowers, etc, and see what comes out of it. This being said- I almost didn't give this one up! It is too cute!! I know I am gushing over my own creation- but I feel I can do this from time to time! Well- I am rambled on long enough! Have a good evening everyone! Stay safe out there and be good to one another! Hi my blog readers! How is everyone Sat. evening going?? Well, I have been spoiled in some regards, but frankly I deserve the time off. I took some time off to have some "mental health" re coop time, and some time to spend with my mom. My mom has been under the weather lately, and since the rough winter weather we had just a few weeks back, I hadn't had the chance to go see her. So- I made her a card instead. I think she liked it. 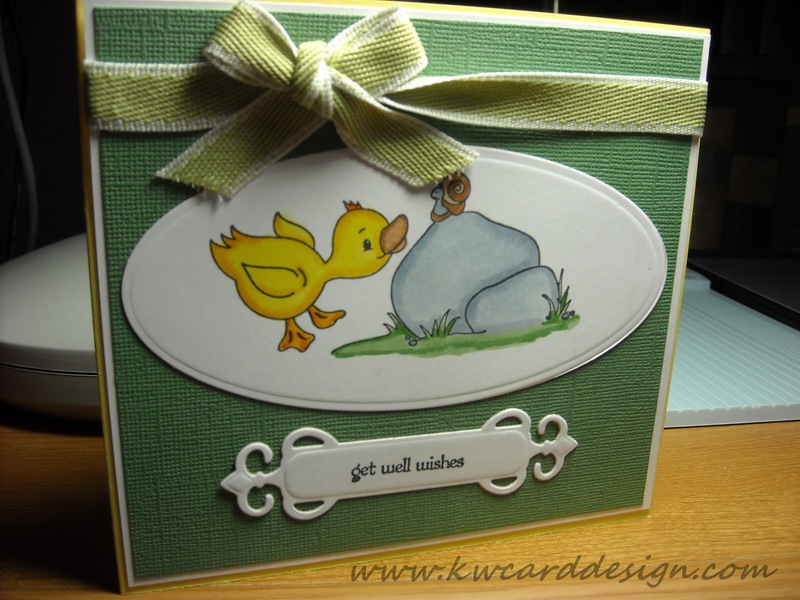 Who can resist this 'lil duck?? I had a sneakin' suspicion that she would like him. I tried my hand at some more Copic coloring. I'm still learning, but what I love about these markers, whether you are just beginning or a professional, your image always comes out looking so nice!!! 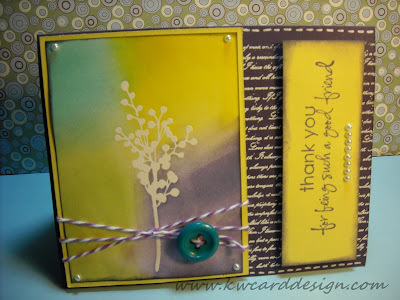 This sweet image is another Gina K. Designs stamp set. I also used some of the "Fancy tags" from Nestabilities. Tonight it is going to be short and sweet. Night everyone! Hi all- The last few days have been beautiful weather wise! If it has been possible, folks around here are outside enjoying the weather for sure. It is a great time to have a birthday right now. 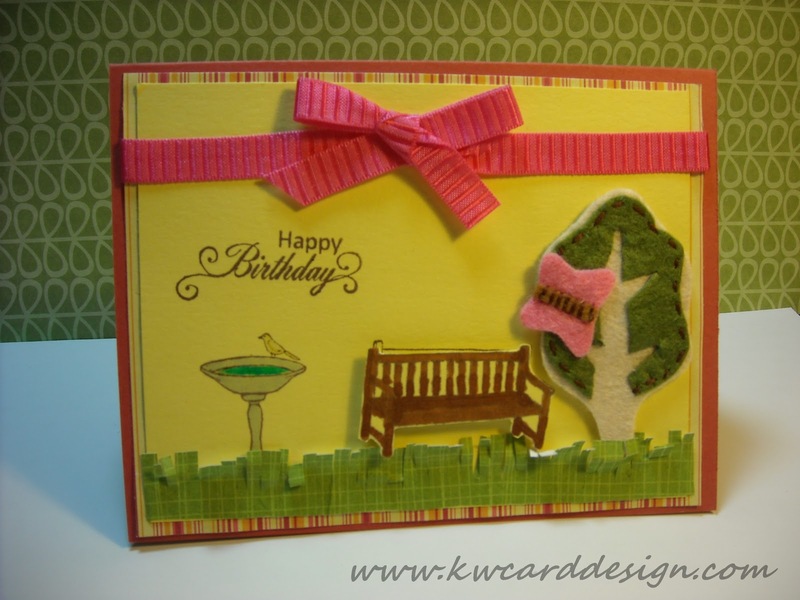 I have made several birthday cards within the last few days. Today was no exception. I wanted to share with you one of the that I made for a co worker. It is colorful and fun, and that would make anyone have a smile on their face. This features one of the new stamp sets I purchased from SU, called "Bring on the Cake". There are several different stamps in the set. A fun variety! I also took advantage of using some of the new SU ribbon that I purchased. This is the first time that I have bought and used their ribbon. I like it very much!! And! It is a great value for the money. You get a lot of ribbon, which I was surprised! I will be buying more in the future!! Well - on a personal front, I will be having some leisure time off of work the next few days. The weather should be nice!! I think I have been getting some great responses from my You Tube videos I posted earlier in the week. I haven't received any bad comments. As my grandmother used to say " No news is good news". She was a very smart woman! Well folks, that is all from me this go round. I will be back once again with a new card share! I also want to share a project with you that I made for a dear friend ( her request). It turned out nice! Stay tuned for that!! Craft Room Videos are up! Hi all! Well, I have finally come through with my videos! First- Happy Valentines Day to you all. I received lovely flowers from my hubby today at work. They smell so good!! I am leaving them at work because I can enjoy them more there and at home where my cats would get into them. I have been promising for a couple of months now that I would do some videos on You Tube, and I finally broke the ice with doing a Craft Room Tour. I won't lie- getting the videos loaded onto You Tube was a bit of a pain, but that is because of my own ignorance in not knowing how to do it at first. Now I shouldn't have any problems. So- here are the links to the videos. Enjoy everyone!! I will be back in the next day or so with a card share!! Take care and be good to one another. Hi my friends!- I just know that Spring is right around the corner! It has been a very cold few months in the area. Well- now that I think about it, the whole country pretty much has been very cold, with nasty winter weather. It is time to bust out of all that, and enjoy the warmer temps, and the bright, beautiful colors that Spring offers! I am all for it for sure! Well- I sent out my cards for the card swap I am involved in, now just the anticipation of receiving 5 cards back! 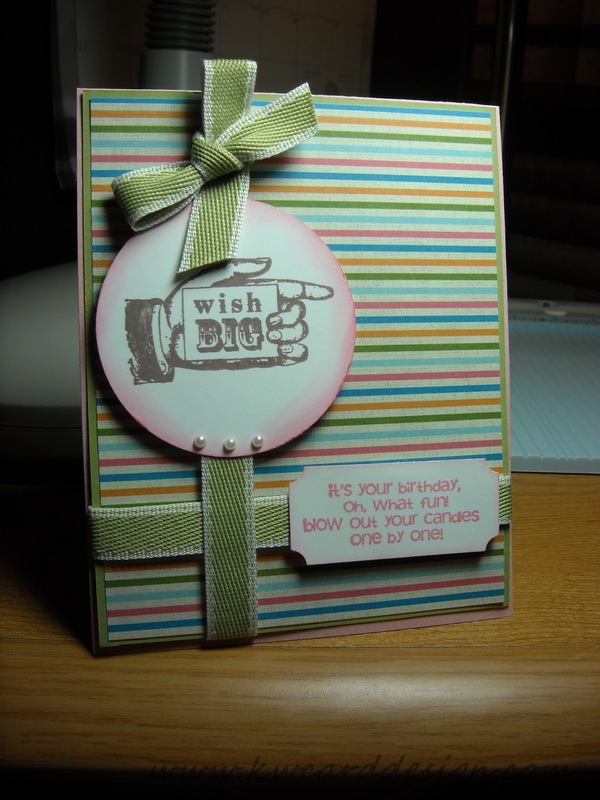 I am looking forward to see what I receive from other wonderful card makers. 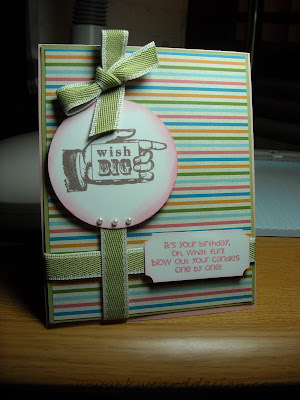 This card I am about to share with you is the 6th card I made for that swap. It was one of my favorites. They ALL turned out good though I must say. I used the "resist" technique on the card. First I stamped the flower image, and embossed it, and then took some various colors of Distress Inks and blended around the image, and the ink resists the embossed image, leaving the flower bright white. I think it is a cool technique. I also used ( as a requirement) a Gina K. Designs stamp set. I used 3 different stamps from the same set called "Botanicals". It is a very nice set. I would recommend it. On the video front::: I am going to try my hand at making a video of my craft space this weekend, and get it up on You Tube. I have been talking about it for a couple of months, and I just need to get it done. Well, think I am going to treat myself to a vanilla caramel iced coffee, and get my Sat. started! Have a nice weekend my friends!! Hi all!- It has been since Friday since I have shared a card with you all. I've said it many times- there is just not enough time it seems for everything you want to do during the day. If work isn't crazy enough, I got to manage my time to fit in my favorite hobby, and sometimes I don't get to do that because I am so tired! Luckily- I am making the time for you all tonight to share another card. I have been making some pretty good ones for friends, and I'm about to send off the cards I made for the card swap I have been telling you all about. I am really anxious to receive other cards from people I don't know- and in turn make new friends that share the same love of paper crafts! On this card- I did the art of paper piecing. I am trying to use some of different techniques that I have seen so much from other card makers, and expand my "skills" if you will in getting a bigger variety of the cards I make. I really love how this one turned out! It has some beautiful spring colors! What do you think?? 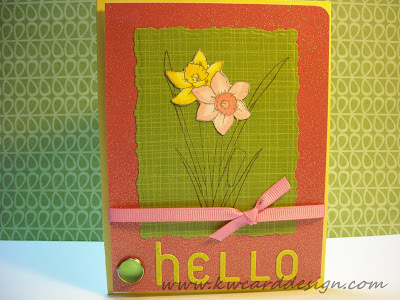 I used another Gina K. Designs stamp set. I color the flowers with some of my Copic makers. I hear that Gina K. has just celebrated her birthday. Happy Birthday Gina K.! We are nearing to Valentine's Day. Wonder what my hubby has in store?! :o) We will soon find out. Reminder that I have an Etsy store, and would love to add more items, but need to sell the current ones. Check it out!! Have a good night all! Hi all!- Can I just start out by saying, I loathe winter!! I am ready for spring!! Thankfully for today's case anyway- I am glad I don't live in Springfield, MO and in the surrounding areas- they have lots and lots of snow and ice. We have minimal snow and slick streets. I digress. Well, at the moment I am currently involved in a card swap which features us having to do a Spring themed cards. Tonight, I wanted to share one of my cards with you that I have been creating for that swap. I tell ya how much I would enjoy sitting on a bench on a spring day around the butterflies and birds drinking from the water fountain right now. It is suppose to get down in the below digits tonight. For my friends/readers in Canada, I don't know how you do it!! My hat goes off to you for sure! In other news ::: I have been following on YouTube the CHA Winter show. It looks like there are going to be some pretty neat products coming out. I love NEW stuff. I have my eye on the Ecraft cutting machine from Craftwell. This thing is neat!! I know it isn't new, but it is new to me. The best part, it works like a printer pretty much, and you don't need a cutting mat!! It looks so much more user friendly than the Cricut- my opinion of course. I wanted to give a special shout out to Momo! I'm looking forward to my card from you Momo! I am super excited!! Thanks again!! OK! I am calling it a night. I need to go wrap up in my blanket and get warm!! Night all! !